This post might be coming a bit too late for most of us, as I hope you have most of your Christmas shopping done already. If you don't, then I hope this helps. And if you do have your shopping done, then just tuck this idea away for next year (or for a birthday or other such gift giving occasion). I saw an idea in Kids Craft Weekly for creating little craft kits for children (I especially liked the wooden spoon puppet idea). They suggested it as gift idea, or as something to have on hand to entertain little ones when needed (like at a long family dinner over the holidays). I think I'm going to hang onto these ideas as activities to pack in our carry-ons coming home from Ethiopia with our two children. After I saw this idea, I began thinking of all the many kinds of kits like this that could be created (craft kits OR activity kits). And of course, I started thinking how you could make kits like this to correlate with a kids book. Include the book with the craft kit and you've got an awesome gift! I mean, what's better than the gift of a book? The gift of a book with something fun to do after you read the book! The Mitten, by Jan Brett: Include a felt or fabric mitten that you can velcro together; along with felt, plush, or even paper animals to stuff inside the mitten and act out the story with. Or include some lacing mittens made out of cardstock or cardboard and yarn. Maybe throw some crayons and/or crafting goodies to decorate the mitten with too. Not A Box, by Antoinette Portis: Obviously, include an AWESOME box with the book. You could get really creative with this one, and wrap the book up inside a really large box. Or perhaps wrap the book up inside a series of boxes all stacked inside one another. 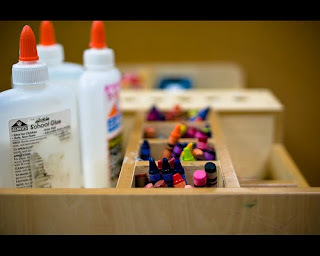 Include paint or markers to decorate the box with too! I can think of some kiddos I know that this gift would be a big hit with! Endless hours of fun! And depending on where you can get a box, it might cost you hardly anything at all! The Very Hungry Caterpillar, by Eric Carle: I made the most awesome little felt pieces to use with this story, and I also made a caterpillar puppet (of course) out of socks. My students love to play with them. It took a bit of time to make, but didn't cost much money and was fun. Polar Bear, Polar Bear, What Do You Hear? by Bill Martin Jr.: Make a CD with the actual animal noises on it (you can find them on itunes). It's pretty fascinating to hear the zebra bray and peacock yelp. Also include paper plates, constructions paper, and additional supplies of your choosing to make animal masks with. Be sure to include instructions as well! How fun to think of them wearing their mask, and then learning (from the CD) how to make the animal noises, just like the real animals! So there are a few ideas for you guys to run with, or maybe to get your own wheels turning. I bet some of you have some other really great ideas as well. Share them in the comments! I wish I thought about this kind of thing earlier. I'm definitely going to remember this for the future! End of A Great Decade! 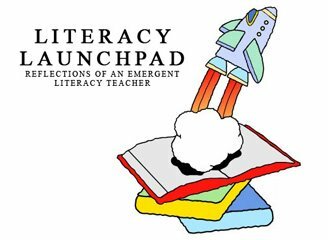 A Gift for the all the Literacy Enthusiasts! Let the Christmas Reading Fun Begin!